You’ve been there, don’t lie. I’m not even going to pretend that’s not one of my actual conversations when engaging in our favourite past time. 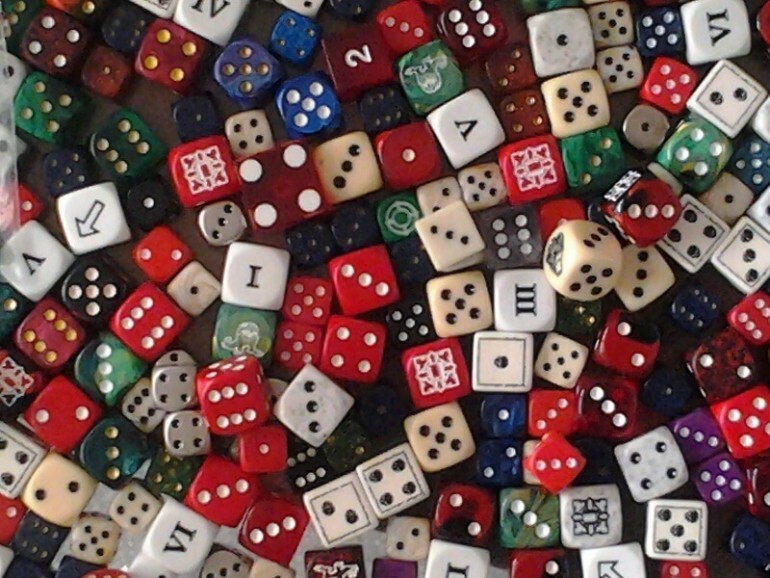 The history of dice is interesting. The word comes from Latin “datum” or “something which is given or played”. Depending on how your rolling is going, you may want to give them away. Often at high speed and occasionally at the friendly, smiling face on the other side of the table. These double as gaming aids as well as assault weapons. 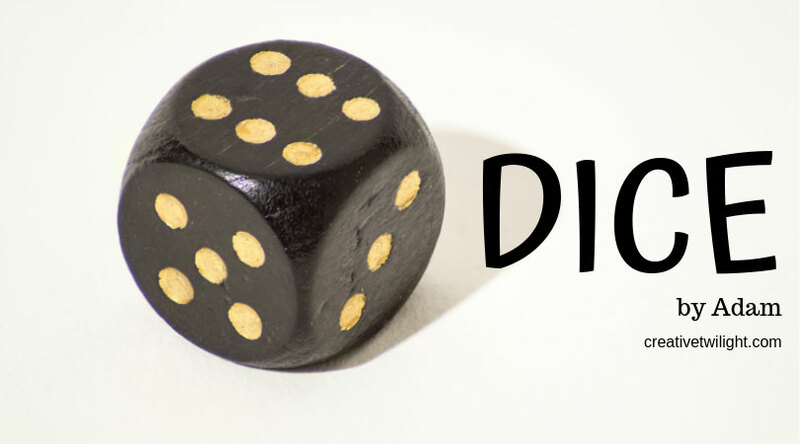 Some of the earliest dice were excavated from a Mesopotamian tomb, dating all the way back to the 24th century BCE. They were found with a board game and the fact it was in a tomb leads us to the conclusion that Risk was causing people to fight even back then! The dice found in the tomb had consecutive numbering on them rather than the modern dice where opposite sides add up to seven. Over the years, one tends to collect dice. New games come out with the weapon of choice packaged in. Retailers are always coming up with new and sparkly designs to appeal to the Magpie in all of us. 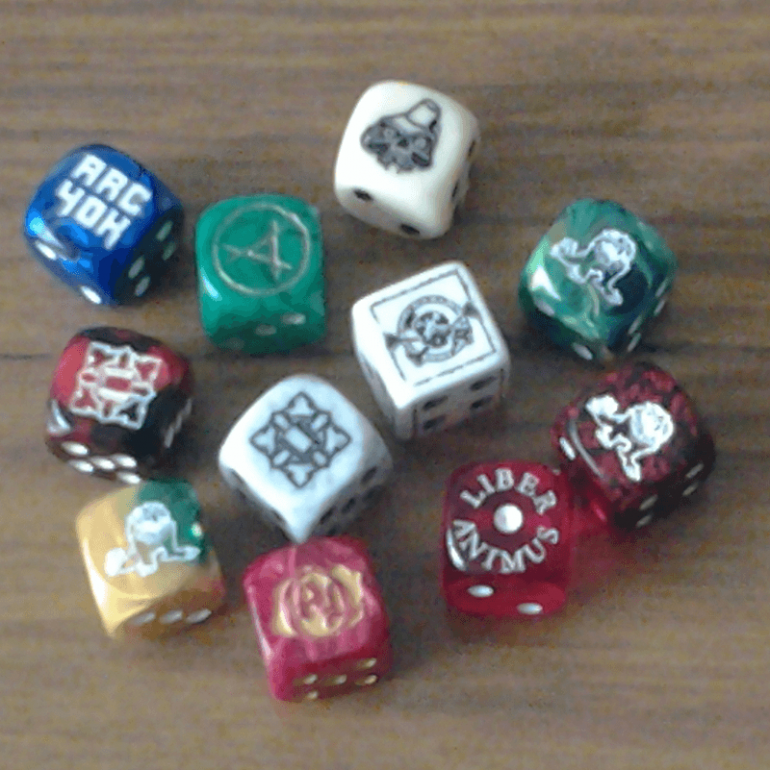 Of course, as proper wargamers, we recognise the existence of “other” dice in the multitude of sides and shapes. As you know, real men roll six-sided dice. 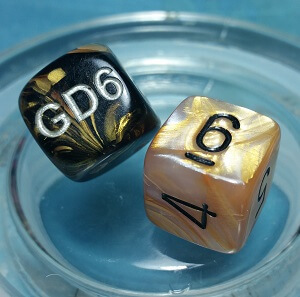 Tournaments and events often use dice just as a cool marketing tool and who doesn’t love being able to roll off in that first game with the official dice for the event? In the picture above you can see the “official” Bolter and Chainsword dice from a few years back. I don’t know what it is about these ones, but they are remarkably lucky (even when not playing Space Marines!). Maybe they are carved from the bones of deceased Space Marines and that’s why they work so well for my Plague Marines. If you see me rolling them, it means things are getting serious-up-in-here. And here’s where we hit the rant. At our core, humans are a superstitious lot. And I am no exception to that. When the action is on and the bullets are flying, don’t be messing with my dice. 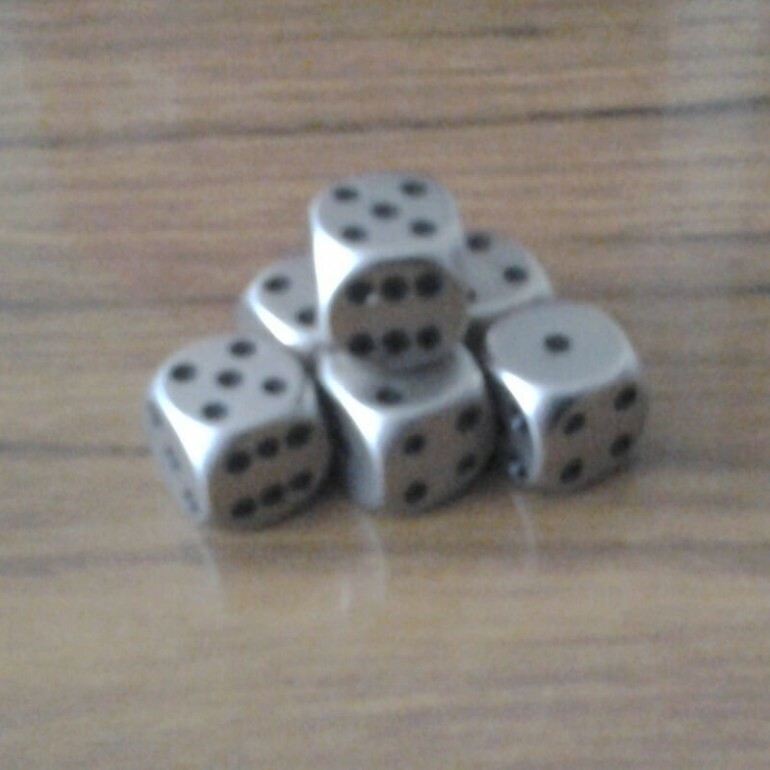 I’m often found rolling them around in my hand to “keep them warm” or putting them in piles of lucky and unlucky dice. There’s a whole world of totally rational and sane behaviours at work and I’d hate for you to mess that up for me. Most tournament player packs specifically mention bringing all the required components to play the game: rulebook, army lists, deodorant and FREAKIN’ DICE!!! Seriously. Don’t. Touch. My. Dice. Because, if you didn’t bring dice/don’t have/can’t borrow (at a stretch) dice, it’s not going to be a very interesting game, is it? Sure, you can move units around the table, check distances for shooting, but when it comes to crunch time … your guns have no ammo? You change your mind about pounding in my face with a Power Fist? I don’t think so. The funny thing is, I’m NOT the extreme end of the spectrum. I KNOW you’ve got superstitions about your dice. What are they? * I know that Malifaux doesn’t use dice. It’s the same basic concept. Sort of. I find people with superstitions comical. The sports fanatics who think that things they do have an impact on the game. The person who has a lucky shirt, hat, etc., that they have to wear for special things. It all just amuses me. But, that’s me. I’m a programmer and deal in the realm of logic and structure, and superstition is anything but. Yeah. Me too. Normally. Now don’t touch my damned dice! I feel like the two sets I got from GW during 6th Ed roll better for me than others. Probably just confirmation bias, but they do have sharper edges than most, and I’ve seen some evidence from GameScience that dice with rounded corners tend to roll lower slightly more often, and that it’s even more pronounced with smaller dice*. The requirements that casinos have for their dice seem to me to support that as well. *Even so, we’re talking thousandths of a percent here. The difference should not be noticeable in the course of a 40K game, or even a tournament or league. I’ve heard the same on dice and square edges, which is why I don’t use Chessex dice. 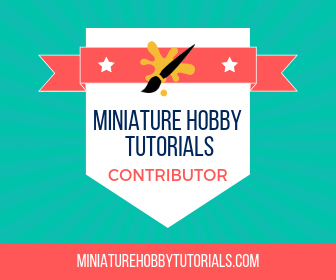 I use some from a company called Koplow Games because they have 12mm square edged dice. The only problem is finding their dice anywhere. I used to order from a store in Texas of all places because they carried them and I could buy them online. I thought that name sounded familiar. Just looked up Koplow, and I know I have some of their novelty dice. I might have some of their standard ones around, too. If I need more, I’ll try to keep them in mind, because those look like good ones. I highly recommend them if you can find them. Like I said, I have 24 of these GW ones that I love, and I rarely need more than that. And I’ve got a half-gallon jar full of dice that I don’t actually use, so I don’t really feel like getting more unless I know I’m going to use them. The Monopoly Rage is positively sedate compared to some of the Risk-guments we’ve had in the past. However, your square dice hypothesis is believable. My Bolter & Chainsword dice have sharper edges than my other dice and they roll like a demon! Which gets worse tends to be contextual. Risk arguments are usually worse in groups of friends, while Monopoly arguments get worse in family groups. I know people who still can’t be civil with certain relations of theirs because of Monopoly games that took place years, if not decades, ago. I looked up the topic on google, and there has been quite a bit more done on the topic since I last looked into it. Still got about half of the results to read through, but all the ones I have read so far have agreed, at least in general, tho there was obvious variation since each was working from a different sample of dice. I have 36 yellow dice with black pips. I decant 20 of them so I always get a random selection but there are times when my rolling can be unbelievably good at one tournament or unbelievably bad at another. I’m sure that means they balance themselves out over time but if one game you’re rolling ridiculously hot you do have to question their randomness. My big issue is dice for wounds. OK if you have different coloured dice or D12s but even so they can be easily knocked over and you have to remember what facing it was. Hence why I use wound counters, you just have to ensure they stick with the the right model! The concept of the Dice and the dices themselves, appeared in the prairie from Europe to China. From there they came to Mesopotamia. They came up with their sons and daughters Aryan. For these nomadic tribes, dice was a religious act. Aryans worshiped good fortune as a deity. The modern view of the hexahedral cube they became in Mesopotamia.